Mountain Fever Records has announced the release of brand new music from America’s Got Talent rising stars, Mountain Faith. “Emily (It’s Love)” is available to radio and consumers today and is the first single from the band’s upcoming album titled That Which Matters, due for release this Autumn. North Carolina’s Mountain Faith is Summer McMahan on fiddle and lead vocals, her brother Brayden on banjo, their dad Sam, on bass, with Luke Dotson on guitar, and Cory Piatt on mandolin. Although the band has been performing together since 2000, it’s only been in the last few years that the music industry has begun taking note of the talented ensemble. 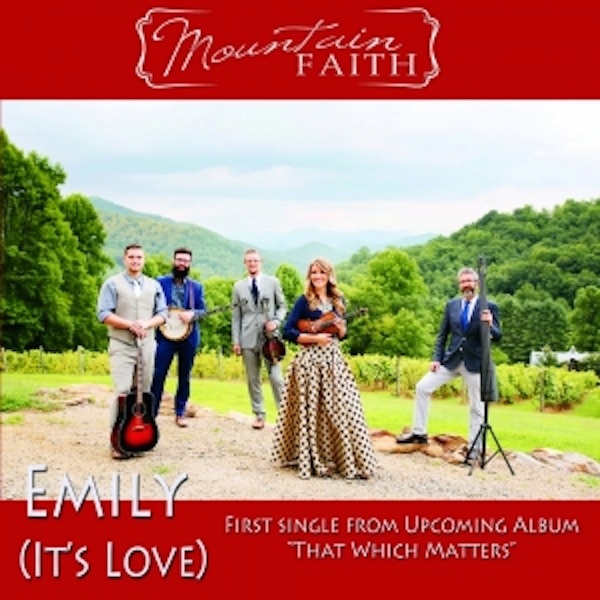 In fact, Mountain Faith just received their first IBMA Awards nomination for Emerging Artist of the Year while Summer received a nomination for IBMA’s Momentum Award in the Vocalist category. The awards will take place on Thursday, October 1st in Raleigh, NC and the band hopes to be in attendance. While bluegrass fans may have been on the Mountain Faith “bandwagon” for a few years now, the rest of the country is really taking notice of the family band as they appear regularly as contestants on NBC television’s popular show, America’s Got Talent. Thus far, the band has made it through the Judge Cuts and will now be voted through to the finals by the television viewing audience. The band has gained a vast amount of new fans through their performances of popular songs in a bluegrass style. Their next performance will be live from Radio City Music Hall in New York City on August 25th. The show will air at 8:00pm ET on NBC and everyone is encouraged to watch and place their vote for Mountain Faith. If the band wins the competition, they’ll be awarded a prize of $1,000,000—allowing them to ease up their work schedule at their family business, High Country Tire in Sylva, NC, and concentrate more on their music business. Radio programmers may download “Emily (It’s Love)” via AirPlayDirect and consumers may purchase the song through iTunes. For more about Mountain Faith, visit Mountain Faith Band Website. For more about Mountain Fever Records, visit Mountain Fever Website.